Sidney Crosby is to Mario Lemieux as Evgeni Malkin is to _____________? The obvious answer is the immortal Jaromir Jagr. I hate using the word "polarizing" but Jagr is the epitome of exactly that. You mention his name in Pittsburgh and you are sure to get a strong reaction either way. 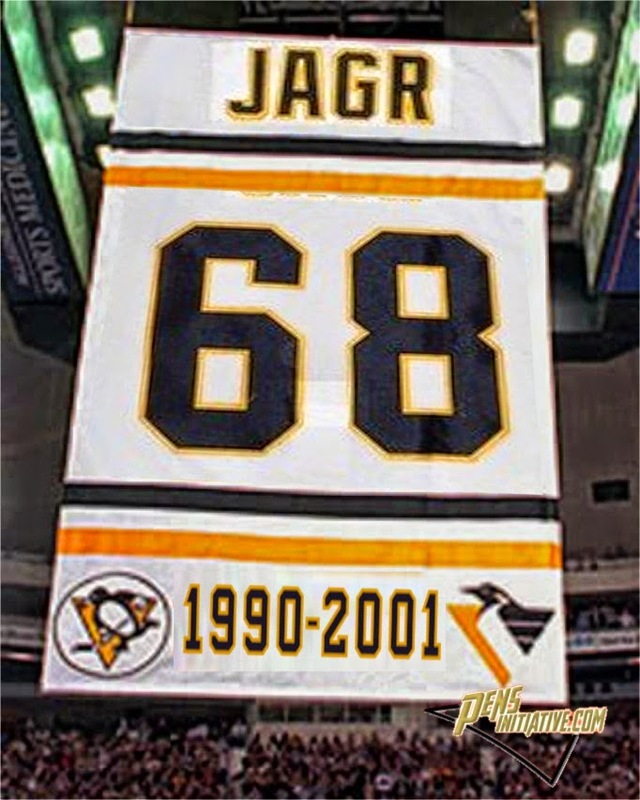 The question I like to bring up is, "Do you retire 68 to the rafters when Jagr hang up the skates?" I literally get a 50/50 answer of Hell No, and a definitive Yes. There is no NHL rule for retiring numbers. It's strictly up to the team. There are 122 retired numbers in the NHL with Gretzky being the only one retired league-wide. Wayne Gretzky, Patrick Roy, Mark Messier, Bobby Hull, Gordie Howe, and Ray Bourque have their numbers retired by multiple teams; an honor - I think - it's beyond a player like Jagr. In fact, the premisis varies so widely from team to team that Joe Mullen's number is "honoured" but not retired in St. Louis but the Wild retired the #1 for ... the ... fans? I was going to put a video of it below but it's so embarrassing that none exist. 2000 happened. The Pens were #16 in league attendance the lowest it was for years but with Lemieux coming out of retirement his 5.25m and Jagr's massive 9.8m contract it was clear that salary needed to be shed. 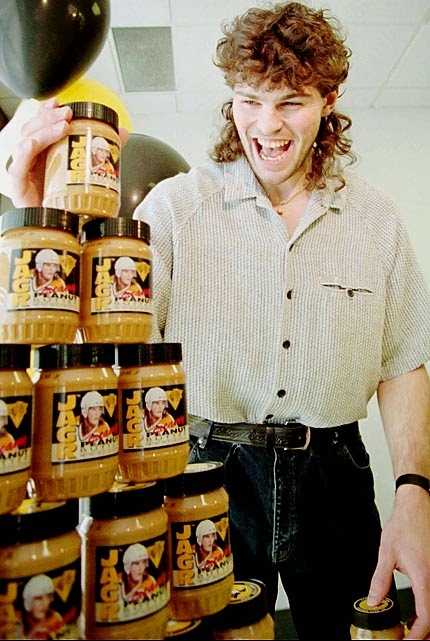 Jagr was then traded in a shrewd and horrific trade with the hated rival Capitals for a bunch of jabronis. In the pre--internet days and with no cap geek or twitter, people saw this an an act of treason. 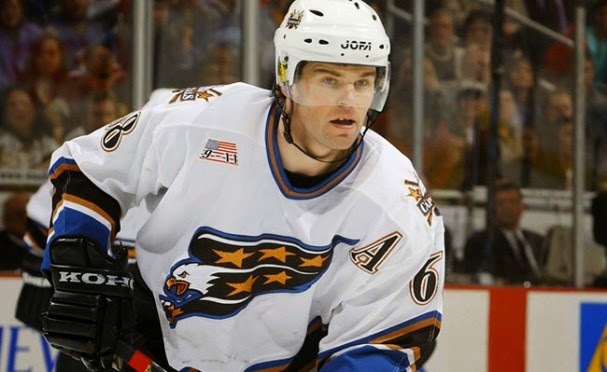 It later was reported that Jagr famously said he was "dying alive" in his last year in Pittsburgh and didn't get along with then head coach Kevin Constantine. When they got a Czech coach Ivan Hlinka to appease the pouting star he was still unhappy which was either strategic team spin or Jagr's excuse to go find a huge payday with another team. He got a record setting 77m for 7 year deal with the Capitals, cut his famous mullet, and put on the Capitals sweater. This was really a big deal at the time. Jagr: "The team went through the tough time with the bankruptcy (in 1999)," Jagr said. "It didn't have a lot of money. I thought it would be easier for the team to trade one guy than let go of three guys. If they would have kept me here, they wouldn't have signed Alex, Marty or Robert. I just wanted to make it easier for the team. 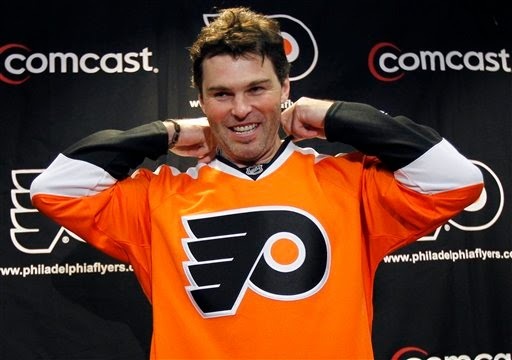 Jagr couldn't carry the Capitals and Penguins fans delighted not seeing Jagr top the league in scoring and getting eliminated in the playoffs early. In 2003, the Capitals had enough of Jagr already and wanted to trade him away in order to cut salary and rebuild. Glen "Money Sack" Sather who has a long history of paying top dollar for whomever the sexiest available player is of the season worked a deal with Washington to get Jagr on the Rangers where he played the remaining 5 years on his contract. Jagr was back in the (then) Atlantic division and was subsequently booed again by the Igloo inhabitants. To sum up, after the Rangers deal was up Jagr sojourned to the KHL presumably to get paid unrealistic money to finish up his legendary career in Russia. He played 3 years there and at age 39 had interest in going back to the NHL. The interest turned into a full blown speculation explosion (a speculsplosion (TM)) of where Jagr could go. During the 2011 off-season, this was like a mantra to Pens fans as #JagrWatch hit manic levels. Hell, fans all collectively wrote him in on the opening day line-up that season. Somehow fans (me included at the time) thought Jagr owed us something. He owed us by being traded to our rival team, he owed us for playing for a divisional opponent, he owed us for the few years of embarrassing school pictures with majestic flowing hair capes. As fans, some of us assumed that it was done intentionally to spite us. That's what fans do though, we internalize the triumphs and pains of our favorite teams and expel in healthy and unhealthy ways. After a year in Philly, Jags bounced around the NHL to Dallas, to Boston, to New Jersey all inconsequential. Jagr's journey in his hockey career is probably considered very untraditional, his tinelessness and and ability well surpass anyone of his peers in the sport. Does he deserve his number retired by the Penguins? For all the reasons mentioned above, Jagr weaved himself into the fabric of the Pittsburgh sports community positively and negativity. For a decade (more than any time on one team in his career) he was who we loved, cheered, and counted on. The decision NOT to raise 68 from the rafters I would have to believe would be Mario's and his alone. There are plenty of rumors about the two Pittsburgh legends not seeing eye-to-eye but who knows what's true. I think not honoring his number would be ignoring a large slice of Penguins hockey history including the two Stanley Cups in 91 and 92. Being a victim of a team heading for a second bankruptcy is not his fault. The embarrassing return Craig Patrick got for Jagr is not his fault. The money the Capitals gave him was not his fault. His trade to the Rangers had nothing to do with the Penguins. His quote in The Hockey News was nothing but a kind compliment for the best player in the game not a verbal contract. The Penguins simply did not try hard enough to acquire him in 2011 as he turned down bigger offers from Montreal and Detroit to go to the team that showed the most interest. I hope when Jagr decides to retire once and for all the Penguins do the right thing and raise the 68 to the Consol ceiling.